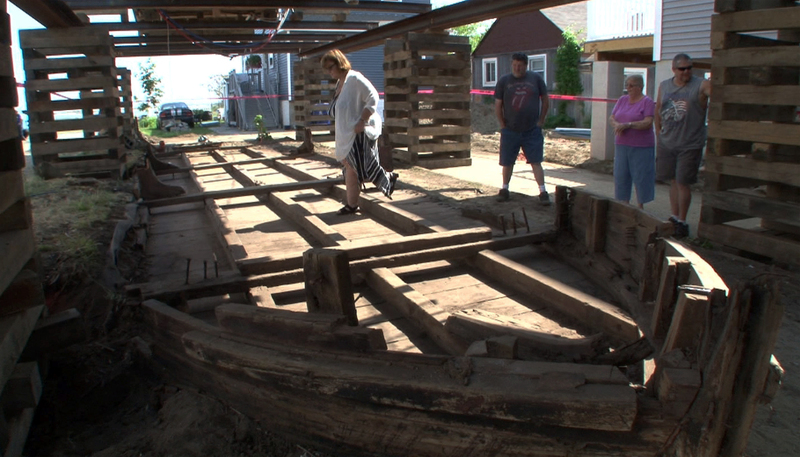 Highlands, NJ - Workers raising a waterfront home in New Jersey made a nautical discovery: a 44-foot wooden boat from the 19th century. The 12-foot wide vessel, its rudder fully intact, was found beneath Eileen Scanlon’s Highlands bungalow on Wednesday, the Asbury Park Press reported (http://on.app.com/1sRr5bR ). The boat likely was used to transport coal and other good along local waterways, and pieces of coal were found scattered along the floor. Rumors of the vessel’s existence had circulated for years. Scanlon got a peek of what looked like a rudder through the home’s crawlspace shortly after buying it in 2010, but she didn’t anticipate the size and scope of the boat. It’s built from 3-inch-thick wooden plants and is held together with 18-inch iron nails. "It’s built from 3-inch-thick wooden plants ..." Would those wooden plants be trees? Yes, 3 inch pieces from a tall wooden plant called a tree, also known as planks.